According to nitrogen consumption for 10-20 courses of procedures you can use changeable vessels, supplied in basic set of cryosauna. Large volume vessels (100-200 liter) of foreign manufacturers can be used for nitrogen transporting from the manufacturer to the consumer and to plug in directly the installation as a consumption vessel. This delivery scheme is employed concerning the installations delivered in Europe and they got the name Euroset. Cryogenic tanks are stationary vessels with 0,5-500 cubic meters volume, they can be used for nitrogen delivery from manufacturer. Traditional scheme of using cryogenic tanks has nitrogen draining in small vessels (16-29 liter). Since 2004, KAEKT-01-"KRION" can be plugged in the tank by the pipeline with the length of 20m. Direct plugging in the tank is the most effective way during using the installation no less than 40 procedures per day. For nitrogen delivery it is necessary to have technical thermoisolated vessels, 16-5.000 l. in volume. The choice of nitrogen delivery scheme should be economically proved. In the construction of cryosauna KAEKT-01-"KRION" is the principle of evolutional development of nitrogen delivery system. The principle is based on using of small volume vessels (16-29l.) as changeable connection in the installation in filling-up compartment, which is provided with semi-automatic spray system for nitrogen delivery to power device. Unique filling-up system is very simple in using and is absolutely safe. 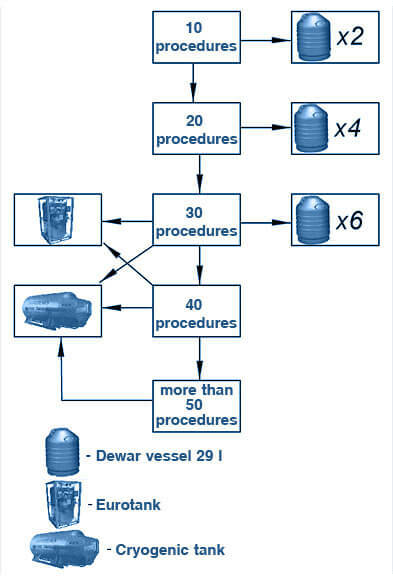 Basic system supposes to have 2 vessels in supply, their volume allows to do 10 procedures. From 10 to 30 procedure it is possible to use changeable vessels for delivery, but at 30 procedures labor intensity becomes very high, that you should use vessels of middle volume (100-200 l.), so-called Eurotanks. Eurotanks. The following development of this system makes buying of stationary vessel more profitable and direct plugging in it by means of pipeline. Such kind of plugging in permits to turn to maximum operating capacity of the system, more than 50 procedures per day. According to maximum quantity of procedures per hour (15), so you can serve 120 patients a day, and you will need no less than 120kg of nitrogen.